As our readers know, we troll the websites of supporters of the native plant movement, looking for clues about the basis for belief in that ideology. We hope that our understanding will enable us to provide the scientific information to our readers that will reveal the fallacies of nativism. “It is interesting that your post shows the trail side covered with English ivy, and possibly a fallen eucalyptus or two. Each of these is a non-native element. 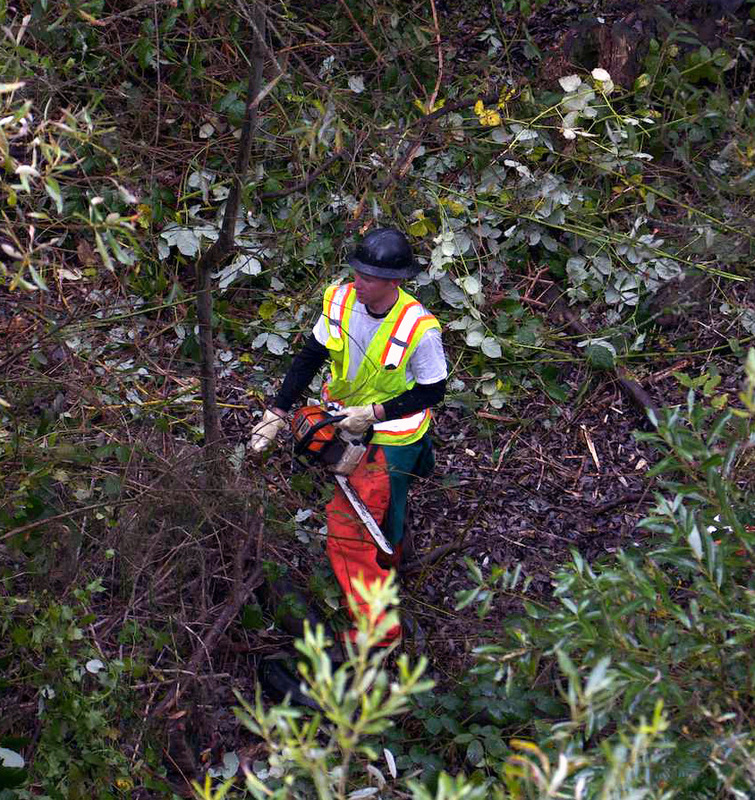 Any and all exotic species present in the canyon destroy the wilderness aspect of Glen Canyon Park. Please note the term “wilderness”. It implies natural, native flora and fauna; the wild plants and the bird and animal populations that support one another. That is what we want to have if we want a wild retreat. A morass of garden escapes and foreign invasive species is to be deplored. Let’s progress toward returning the area to a REAL wilderness. Do not let the concept that a plant’s becoming established in an area is a sign of its becoming native to the area. It remains an invasive element, a weed. It disrupts and destroys the normal habitat of native plants, animals, and insects in its surroundings. In this particular native plant advocate’s view, wilderness is composed exclusively of native plants. Everything else must be eradicated. If chainsaws and pesticides must be used repeatedly in perpetuity, so be it. All this destruction is justified by the glorious goal of “wilderness.” This wilderness is apparently not disturbed by chainsaws and pesticides. Presumably they must be ignored to achieve the glorious goal. We rarely indulge in sarcasm on Million Trees. We hope our readers recognize it when they see it. Webmaster: Yes, we try to laugh. We can’t always manage. As an horticulturist by training, i also bought the “natives are better” dogma until enough time passed and i began to see that the dogma is not valid. So after 40 odd years, i see that one concept does not work very well in the real world. Just as we celebrate diversity in our human populations, i find that plant diversity is equally important and compatible with animal species diversity. Nativism is not sound concept any more. Webmaster: It is very encouraging to hear that you have altered your view based on your experience. We can only hope that others will do the same. We agree, that native plants had an intuitive appeal and they still do. It is the needless destruction of everything else that has turned us against the ideology. Thanks so much for your encouraging comment. the nativists simply seem to be very slow in catching on to the fact that their worldview is made up of wives’ tales and out and out lies, predicated by monsanto, dow chemical and their ilk. because all roads lead to rome…if that’s too abstract, then how about “all nativist endeavors lead to severe toxic chemical dependence.” and i do mean on roundup, imazapyr and other such birth-defect causing substances. lovely wilderness! where wildlife are given zero respect, and human children in the vicinity are born with problems that society doesn’t like dealing with. did a toxic environment cause my grandson’s birth defects? what nativist would like to prove it didn’t? would they volunteer to help families affected by their free-flowing use of dangerous chemicals? simply disgusting, tree killing, chemical swilling cultists, playing roulette with others’ lives (including their own ignorant volunteers’). not to mention wasting public money making very ugly landscapes, as in the one on the great highway. ms. schemmerling is one of the few who actually notices that the nativist agenda is nonsense. thank you very much for your words! Used in gardens, farms, and parks around the world, the weed killer Roundup contains an ingredient that can suffocate human cells in a laboratory, researchers say. Researchers have found that one of Roundup’s inert ingredients can kill human cells, particularly embryonic, placental and umbilical cord cells. I am so grateful for Death of a Million Trees for shedding light on the absurdity of the extreme” native plant only” position as exemplified in the article discussed here. I’ve lived in Santa Cruz, CA for the past 36 years, trying to protect the 100 year plus eucalypts from the destructive ignorance of the “native plant only” zealots who seem ignorant of the role of big trees (of whatever species) in climate change dynamics. Here’s an example of absurdity.The city of Santa Cruz recently proudly unveiled its Climate Action Plan while at the same time giving its department heads the green light to amend the Heritage Tree Ordinance to exclude eucalypts from protection. The vote will be in the next few months. If passed, eucalyptus haters, of which there are many, will be able to cut down 150 year old trees at will. I understand the desire to plant only native trees in new plantings. I can’t fathom the desire to kill big mature trees which have been alive longer than any of the non-native folks who are intent on their destruction. Of course ignorance has no borders. In Australia and New Zealand, “”native plant only” folks are delighted to cut down 300 year old non-native oaks and 100 year old non-native Monterey cypress. Webmaster: Yes, the fact that it is happening everywhere is no comfort. I would like to tell the story of what is happening in Santa Cruz. If you could send me some newspaper articles or other materials about the tree destruction, I would like to publish an article about it. OK, I think I understand. To have a “true wilderness state,” humans must vigorously manage the landscape with chainsaws, herbicides, and weed pulling.